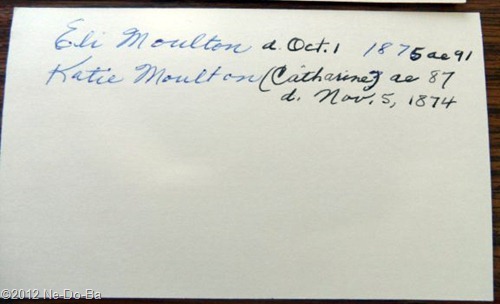 Today’s post will cover the cemetery card from Stockton, NY showing the plot information for Eli and Kate Moulton. I am grateful to Randy Blood for sharing all the wonderful items he photographed during his recent visit. This cemetery record suffers from the same problem as the one for Jane Kanistanaux discussed in an earlier post located (here). It is not a true death record and it is not an original record, only a transcript and/or compilation from one or more presumed original records. The recording of information by humans will always introduce errors and the more times a record is copied the more likely it will contain errors. It appears Eli Moulton purchased the north 1/2 of lot 18 section A on the same day Laton Kanistanaux purchased the south half of the same lot. This date is also the date given for the death of Eli’s wife Katie. It appears the family unit acted together in these purchases at the time of Katie’s death and it suggests they were planning to permanently settle in Stockton at that time. Why else would Laton need a cemetery lot, if he were not planning to stay there a very long time? The information on the back side of the card has me concerned. More than one person has made notes here. The second person has actually overwritten one item. 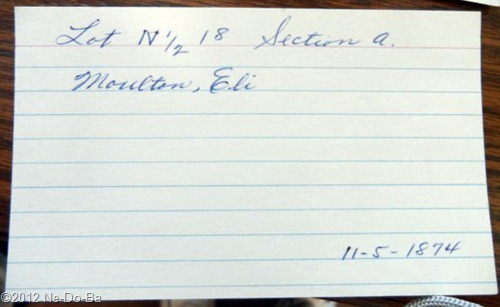 See the black ink on top of the blue ink in Eli’s death year. Who made the notes in black ink and where did they get the information from? Eli’s year of death from the headstone is given as 1876. Here on the back of the card I see it has been corrected to read 1875. Which is it and how do I know for sure which one is correct? Katie’s death year from the headstone is 1875, but here on the card it is clearly given as 1874. Again, who made the entry and where did the information come from? This same person also decided her name was Catharine [sic]. It’s a good guess, but how do I know for certain? Did the information come from an original historical document from the time period of her life? For Katie, I believe 1874 is the correct date and the headstone is wrong. My reasoning is that Eli is listed as a widower in June of 1875 on the New York State Census. Furthermore, this card and the Kanistanaux card give the year of the lot purchases as 1874. Even though I believe 1874 to be the true death date, I certainly would not offer it as a certain fact and would always include an explanation of why the death year is in question. This cemetery card calls into question the death year of Eli as well. Someone has altered the original year so that it appears to be 1875. Again, this may be the correct date, but we should never correct something in this way. As it is now, I can not be sure if it was meant to say 1876 or 1875. The proper way to handle such things is to make notes and at least initial them so others will know they were added after-the-fact. Please folks – never correct something by writing over it. It has the affect of making the information illegible and it creates questions. You may wonder why all the fuss? Why is it important? Not all records are created equal and all records are subject to error. Understanding the source of your information is paramount to understanding its value, its reliability. When we work with unreliable information we form unreliable theories, which often lead us to search in the wrong places for information that may never have been there. Big waste of time! In this case, my quest is to locate records that were actually created at the time Eli and Katie Moulton were living in Stockton, NY, which was a very short time period. Members of the Kanistanaux family first appear in Stockton in June of 1874 and both Eli and Katie have passed away by October of 1876 (or 1875!). Death related records may be the only type of record they will appear on. Plus, these record types offer the possibility of containing data of genealogical importance. I have been assured by a number of people over the past couple of months the town of Stockton did not keep death records until the 1880s. There is no town record concerning the death of either Eli or Katie Moulton. So, where is the information on these so called cemetery records coming from? If this unknown source is in fact real records from the cemetery, then these are the records I want to see, so I can determine for myself what they tell me and learn what information the people of the time period actually knew about this couple. There is another reason I am being so fussy about this particular record problem. Did you notice there is no information on these cards that provide names of parents or birth locations for any of them, nor is there a maiden name for Katie? Is this true of the original source as well or is there more information to be found in the original record? In April of 2003, Mr. Jay T. Priest published “An Index to 65,000 Cemetery Records of Chautauqua County, NY”. I would expect to find information in this publication that came from actual cemetery records. I have a photocopy of the page covering the surname Moulton. There are three entries in the book for this surname in the Greenwood Cemetery of Stockton. They are given as “Eli”, “Katie”, & “Mary (Marleah)”. Wait – the town historian did not provide a cemetery card for “Mary (Marleah)” Moulton or Kanistanaux. Not only that, but all 3 entries in this publication show significantly more data then is found on the cemetery cards I do have. So, just where did this additional information come from – original records or the notes of a modern day genealogy volunteer? I have a hunch the additional information came from a modern day volunteer who has done a little research and formed a theory, then shared the theory (as if it was fact) with the whole world via the internet. Then the world starts copying and spreading this information as if it were proven fact. Once the information is incorporated in a published work with a nice official sounding title it takes on the air of being authentic and historical in nature. So, now we have the situation where the names of Eli’s supposed parents are found on dozens of websites including Ancestry.com, Find-A-Grave, and rootsweb.com, and in publications like the one mentioned above. If any source is mentioned at all, it is referred to as cemetery or death records. So far, no one has been able to provide me with a copy of any such historical document to support the information, but everyone is certain it is accurate, because — all these people just can’t be wrong. Right? WRONG!!! So here we are at the root of the problem. If the underlying information is incorrect, it doesn’t matter how many times you repeat it, it is still incorrect. I can reverse this by stating, if all the sources you find today trace back to the same single source and that source is not correct than all research that develops from that source is also not correct. Why waste time researching the wrong people? If it doesn’t really matter to you if you get things correct or not, then why bother with it at all? Just sit down with a piece a paper and start making up a family tree that suits you and forget about research. It’s really no different. Both ways you end up with a tree full of ancestors that don’t belong to you. OK, enough time spent on this little rant. I have hired a researcher to focus on locating any real historical cemetery records that may still exist. My researcher has proven herself to be persistent, so I am in hopes of success. Still, I am not going to hold my breath. Digging out the old dusty, dirty, fragile records to look something up is actual work and it is just so much easier to claim — “the records burned in a fire”. Good genealogy research requires us to question every lead until we are certain we understand the source of the information, and then probably question some more in case we overlooked something the first time.